Since the birth of the British package holiday, the Costa Blanca has become one of Europe’s most beloved family destinations. But with its historic quarter and elegant waterfront, and a menu packed with diversity, Alicante stands head and shoulders above the rest. There’s much to recommend it to travellers of all types and a wealth of choice of things to do in Alicante. Families flock here for the wonderful weather and water parks, there’s history and heritage down every winding street, and golfing holidaymakers aren’t shy of places to practice their technique. And there’s an excellent selection of beaches, plus accommodation for any budget and a wealth of things to see in Alicante and further afield. 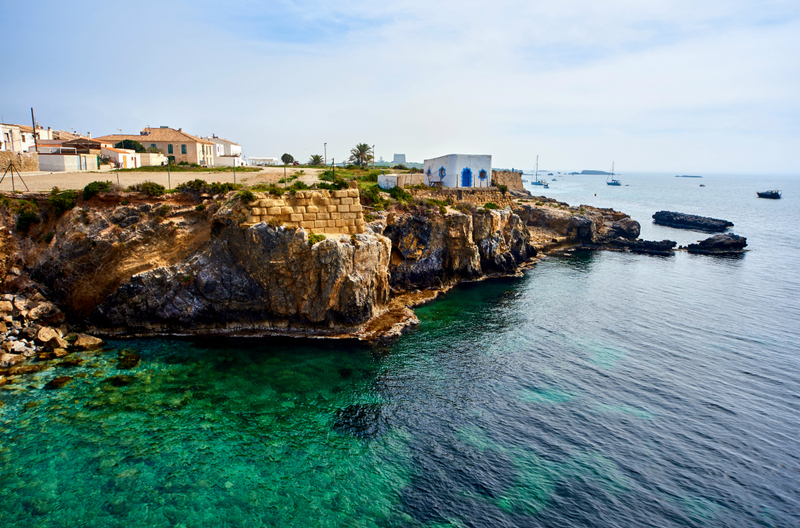 Spain and the Costa Blanca in particular is renowned for its winning combination of sun, sea and sand, but there’s more to it than the swathes of sunbathers suggest. History and heritage are important ingredients of the Alicante appeal, and the Castle of Santa Barbara more than makes that case. Originally built in the 10th century, a walk through this imposing Medieval marvel takes you from the starkness of dank dungeons to an opulent palace via a solemn church, mounted cannons and even a moat. Entry is free, and the castle is accessible on foot, by car or via a lift that starts out from Postiguet beach. Shaded areas are provided by the proliferation of pines that grow around about, and two cafés offer ample refreshment. A stone’s throw from Postiguet beach you’ll find another historical highlight in the form of the Basilica of Santa Maria. Located in the city’s old town, the glorious Basilica of Santa Maria’s Baroque façade is flanked on either side by huge towers decorated with gurning gargoyles. The recently-restored interior boasts Rococó details and a Gothic-style Inmaculada chapel feels welcoming yet wary. The carefully curated Archaeology Museum is one of the most interesting places to visit in Alicante. Taking visitors on a journey through time, exhibits explore local geography and how different civilisations have made use of the unique landscape. Passing through Prehistory, the Iberians, the Romans, the Medieval Age, right up to the modern day, it’s a fascinating and comprehensive experience. Of all the many Alicante attractions, the immaculate island of Tabarca, located just off the city’s coastline, is perhaps the most beautiful. This unspoilt spot is easily reached with a regular service from the harbour. Once you’ve stepped foot on Tabarca itself, you’ll soon be seduced by its quaint rustic village and sweet old church, typical of rural Spain. While away a few hours on the beach before taking a gentle stroll up the coastal path to enjoy a spot of lunch. For many visitors, the lure of Costa Blanca golf courses proves too tempting, and the region possesses some of Spain’s finest. Enjoy a relaxing round on immaculately groomed courses like Alicante Golf, whose diverse greenery and shot selection makes it an ideal visit for players of all abilities. If you’ve opted for car hire in Alicante, be sure to get out and about, taking in the wider Costa Blanca. Head south west to the laidback city of Murcia, with its market gardens and gentler pace of life. Or savour the authentic British holiday experience with a trip to the iconic Costa Blanca resort of Benidorm, just 40 minutes’ drive from Alicante along gorgeous coastal roads. 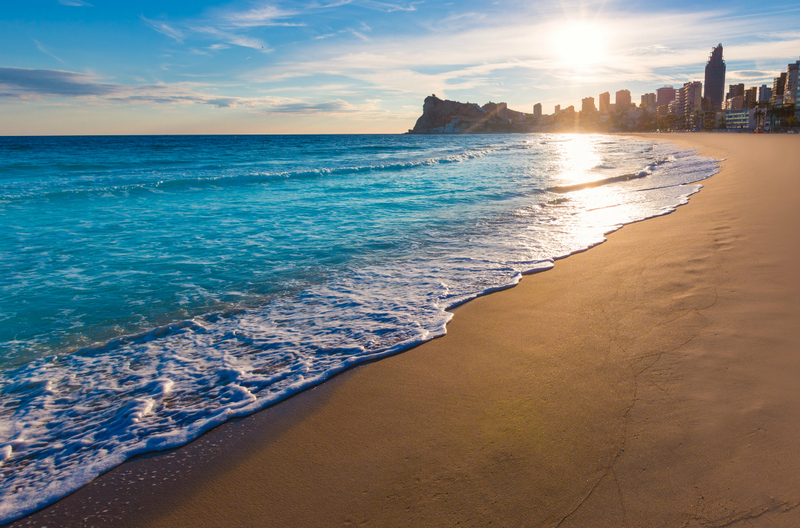 The ideal distance for a day trip, Benidorm is a bustling, sun-drenched former fishing village that has gradually expanded to become the colourful destination it is today. If you’re looking for the best place to stay in Alicante and want to savour the surroundings of the past, El Barrio is the place. The city’s old town is built around the San Nicolas de Barri Cathedral and joined up by the busy Rambla de Mendez Nunez and Explanada de Espana. Accommodation in the area is primarily privately rented apartments or studios and it’s possible to pick up a bargain. Barrio Boutik Hostal offers beautiful balcony views over the Old Town, as well as some rather quirky decoration choices in the lobby – including a stuffed toy giraffe. Away from the Old Town, AC Hotel Alicante offers a rooftop pool for the ultimate in relaxation between excursions, while even more seductive views await from the terrace at B&B La Milagrosa. Daytimes in El Barrio are quiet as holiday makers head for the beaches and locals stay out of the sun. However, when night falls, the place comes to life. The neighbourhood is a maze of interlinked, narrow streets, each one punctuated with lively tapas bars and pavements full of cheerful diners. One of the most popular, and largest tapas bars is Cervecería Sento Barrio in the heart of the old city. The service is fast-paced, the cuisine is authentic and delicious, and the atmosphere is upbeat. 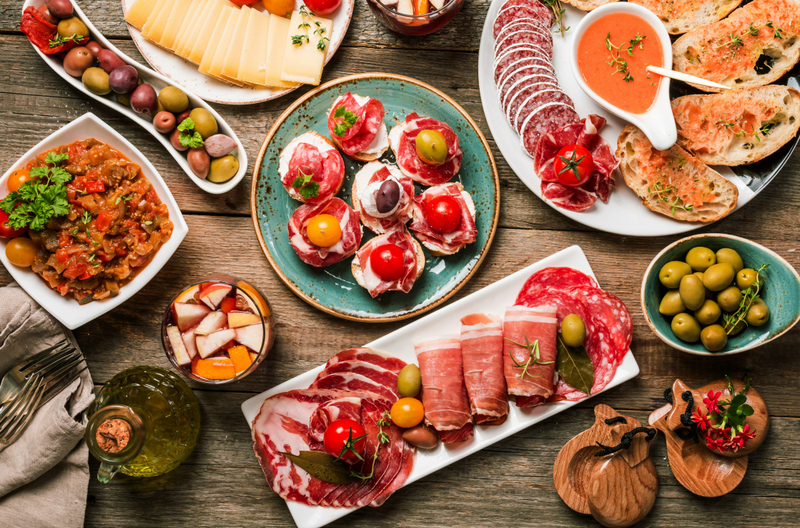 For something a little different from the standard tapas, opt for a seafood specialist restaurant like La Marisquería del Barrio. Excellent seafood Paella, rich fish broths, tender calamari coated in crispy goodness and fantastically fresh salads are all served daily, alongside catch-of-the-day specials. Of course, not all of the food places to visit in Alicante have Spanish menus. If you’re looking for something a bit different, what about an Italian meal? Casa Mia Italian is a little known eatery close to Alicante’s central market. Intimate and welcoming, with a menu that reflects the very best of Italian eating, this place is an excellent find. The stone-baked pizzas in particular are a lesson in simple, quality ingredients perfectly prepared. Vegetarians and vegans are in for a delectable dining experience on Calle San Fernando. Bodhigreen is a stylish little place serving up tasty, modern and adventurous meals to meat and dairy-free, diners. Alicante’s best beaches boast Blue Flags as a symbol of their quality and safety standards. Playa del Postiguet is a long, unbroken stretch of soft white sand that follows the line of the city itself and is home to a number of excellent tapas bars. For a slightly different beach experience, make your way to the coves at Cabo de la Huerta. Grab a few hours of peace and relaxation, gazing into the rock pools and watching the divers practice their skills. Alicante‘s Playa de San Juan is a wide open beach and one of the city’s most loved. Conveniently close to Alicante Golf, it’s also the go-to destination for windsurfing, volleyball and other activities. La Albuferata, to the north-west of Alicante itself, is an altogether more intimate beach and locals flock here all year round for the wonderful views of the Serra Grossa mountains and the fine, honey-hued sands. Perhaps the attraction most closely associated with Alicante, Santa Barbara Castle, invites keen walkers to take the challenge of climbing its rocky base. Of the top things to do in Alicante, conquering the summit of the Benacantil Mountain is perhaps the most rewarding – certainly for the views of the city and sea below. 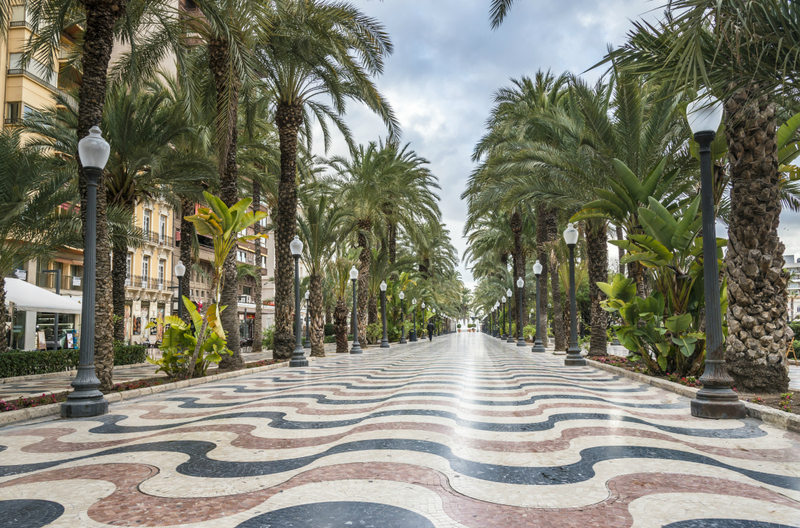 For an altogether gentler walking experience, one of the loveliest ways to spend an early evening in Alicante is a chilled-out stroll down La Explanada de Espana, lined by six million tiles in rich reds, blacks and whites. Numerous bars, restaurants and market stalls sell everything from handmade leather goods and exquisite jewellery to local delicacies and artwork. For even more beautiful natural walks, head south down the coast to Parque el Palmeral, around 5km from central Alicante. Reviews call this ‘a little slice of Eden’ and the park is bursting with lush vegetation, fast-flowing waterfalls, intriguing and carefully tended botanicals, and sweet footbridges. In Alicante, tourism could be limited to showcasing that gorgeous coastline - but with its cultural life, outdoor pursuits and stunning scenery the city has defined itself as a real highlight in the Costa Blanca. It’s no wonder then that us Brits have built a deep attachment to this wonderful corner of Spain with its rich heritage, irresistible food and world-class attractions, returning again and again to visit Alicante.